Exhibition view of Stray Alchemists (2008) at UCCA in Beijing. 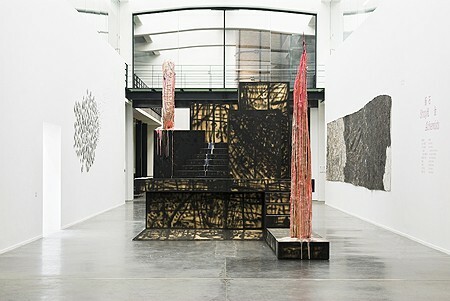 This image shows “Recondite” (2007) by Sterling Ruby, in center, and “Untitled” (2008) by Matt Bryans, on left and right. Copyright Oak Taylor-Smith, courtesy of the Ullens Center for Contemporary Art. I interviewed Kate in May 2008, a little over a month after her first exhibition at UCCA opened, and still less than a year since her arrival at that institution. This interview touches on several subjects, but particularly curatorial processes that engage in the formation of artistic communities and new audiences, and specifically as it relates to Kate’s work in China today. SOFIA: Your move from an academic institution in the US to a contemporary art center owned by foreign collectors in China entails a significant shift of infrastructure. In this new platform and community that you are working with, what kind of unexpected-situations have been emerging and creatively shaping your curatorial practice? KATE: My move to an academic institution in the US was actually the most dramatic move in my career that I have experienced, as before that I worked as a curator in the UK. So, to a certain degree, moving to UCCA was a return to the work I am most familiar with. Of course moving to China is another factor, and one which brings many many incredible experiences. Setting up the masters program in curating was something that put my knowledge and network into a theoretical context, and allowed me to consider the superstructure of curating. During the five years I was developing and chairing the program at CCA, my interest in Asia progressively grew, and that was one of the focuses I developed there. Within Asia I had become very interested in China because of the way that certain artists were pushing the potential of practice in ways that really challenged me. With regards to working for a private institution, well that is a reflection of the current situation in China. The national, government- or state-run museums are still the core of the infrastructure across the country, and commercial galleries were really the first “private” structures to be set up. What Guy and Myriam Ullens have done is to establish the equivalent of a non-profit organization and structure—an art center rather than a commercial enterprise—that allows for more experimental projects to happen. SOFIA: Yes, it is clear that government involvement, or lack thereof, in a state defines the type of institutions, and even kinds of markets, that emerge in a place. UCCA is one of several private institutions, which, at different scales, are running pretty much like nonprofit centers. I think the question always pertains to the collection—who is building it, how, for whom, and so on. KATE: It is unusual for an institution that is non-governmental to have a collection, and that is where it is important to understand that there is, one the one hand, the Ullens Foundation, and on the other, the Ullens Center for Contemporary Art (UCCA). The art collection is part of the Foundation, which is not based in China but in Switzerland. Fei Dawei is the Director of the Foundation, and while he was the founding director of UCCA too he has now gone back to his former position, and curator Jerome Sans has recently assumed the directorship of UCCA. In terms of how the collection develops, this is based on Guy and Myriam’s decisions in discussion with Fei Dawei and their other advisors. Jerome will now be advising and involved in expanding the collection too. Guo Xiaoyen and myself (Xiaoyan is UCCA’s Chief Curator) have been developing a show on the Collection for this summer, called Our Future, which will take place at UCCA. The exhibition will include a broad range of works from the Collection, as well as new acquisitions that we proposed to Guy and Myriam, and some new commissions, which are extending the way that the collection works because they are more performance- and time-based, or socially-engaged projects. This is how UCCA can start to have an impact in the way a collection develops. Jerome is also commissioning site-specific works for UCCA, which will be on view longer than a usual exhibition period and will transform the whole building so that the art-going experience is taken beyond visiting an exhibition and instead becomes immersive. Again, this is a new way of collecting in China. So, UCCA is helping the Foundation to make their collection unique, and to involve Chinese artists in ways that most collections haven’t tried. You also ask “for whom” a collection like this is made for. Again, this relates to the Foundation, which was set up so that the Collection can benefit different publics. The Foundation also supports other exhibitions and projects of Chinese art, so it is supporting Chinese artists in many different ways. The development of UCCA extends this goal, too, for example to develop research into the collection and, perhaps most importantly, education projects around it that are for a Chinese audience. The exhibition in the summer will be the first time there will be a large-scale exhibition of the Ullens collection in China, and there is a lot of education programming being developed around this. SOFIA: You have a peculiar title at the UCCA, “International Curator,” and also two homes, one in Beijing and the other in New York, which speaks of your type of work and life, too. What does the appointment of an “international” curator mean for a center of contemporary art in China, and, what does it mean at UCCA? KATE: When this curatorial position was first advertised it was for someone who wasn’t living in China, who had strong knowledge of international practice and who was skillful in making connections of relevance to China and Chinese audiences, to ultimately relate this to Chinese art practice. That is how I got the position, as I have a broad knowledge of international practice and, over the last five years, I’ve been thinking a lot about how to make sense of a variety of practices outside of their “homes,” so to speak. It’s pointless just dropping art into a context that is completely alien without having a good understanding of what may be of interest, or relevance. It also important to consider ways to open up dialogues about the practices you are presenting in the place that they are being presented, as well as to a broader audience that can’t see first hand what is happening in China. The reason why I am based in two places at once is because it’s important to travel and see work, expand networks, and build collaborations. The reason why I was asked to be based in New York is because the Ullens “family” (the Foundation and UCCA) is in Europe and Asia, respectively, so they felt it would be important to have someone based in the US, too. As with any institution, there is an ongoing discussion and renegotiation about what international means. This is interesting in the current context and pace at which things change in China, and the ways in which the term and idea of being “international” has been used and is increasingly being used for job titles in the arts. KATE: It’s true—there are many foreigners in China, and more and more coming. Many who are here because they really want to go deeply into Chinese culture. This situation presents another angle on what international means. For me, it is really important to start building bridges, to create ways to allow artists to exchange ideas, see each others’ work and think around what can be developed and expanded in terms of the experience of seeing, talking about, and testing ideas. And then I ask myself, too: What is it to be a foreigner? To work somewhere and not be from there? Is that really international? Is it even possible to be “international,” because obviously all your experiences really relate to the local. Its just that some people have the opportunity to experience a number of “locals” at the same time, or perhaps, more to the point, to experience being local in different places over time. With that perspective the question is how do you best facilitate something that involves people from different places, with different perspectives? This questioning is part of the process of trying to find ways to get immersed in one country (China) in a way that allows for people there and abroad to become engaged and get involved, too. SOFIA: Can you talk a bit about your first exhibition at UCCA, Stray Alchemists, which is currently on view? I’m particularly interested in knowing whether you felt, in the research and selection process, that the work of the participating artists could have an interesting conversation with artist-audiences in China. KATE: The whole reason for curating Stray Alchemists was to introduce emerging artists that would in many different ways be interesting to people in Beijing, particularly artists working there—that was why the show was about artistic practice and processes rather than a specific theme. One journalist wrote that he understood the exhibition as me suggesting that Chinese artists didn’t think enough about process, and I was telling them that it should be done better or “like this,” which was something I found really interesting as that is a very defensive position I hadn’t even considered. In all my years working, I have never curated to highlight a lack in the place where the project is happening. That is a colonialist stand point, which in our generation is ludicrous! Anyway, it was not my intention. There are better things to do than suggest what isn’t happening in China and in general. If you spend a couple of minutes thinking about it, you will find that the show doesn’t suggest that art should be “this” or “that,” but the opposite. It’s about highlighting different positions from which artists develop a way of working that allows space for themselves to experiment, test ideas and refine the ways in which they then make something that can speak to people on an experiential level—and the result is that the work communicates more phenomenologically than via a particular message. You feel the work more than you have to learn its language. Stray Alchemists was initially curated in the context of a year-long-program of exhibitions including artists from all around the world at different stages of their career. For the first international exhibition we wanted to have a number of voices be heard and, also, artists whose work was just starting to make an impact. All the artists came to China, and spent time giving talks and presentations and creating music events, both in advance of the show, as well as during it. They also met with artists here, so that it was possible for them to make their own networks, which we hope will extend beyond the exhibition. I know that all the artists are planning to come back to China and are really passionate about their experiences here and the people they met. That was really important to us too, as in our initial thoughts about the program over the year we wanted to extend its reach beyond what we did, and to have the projects create their own resonance and networks for different people. SOFIA: I’m glad that you mentioned the importance of testing ideas as it pertains to art making. In my travels throughout China, I felt there was mostly a discussion about “productivity” (and there was so much to see!) that I missed the importance of doing nothing, or coming up with nothing or simply making something that doesn’t work—and acknowledging that as is, as part of process. KATE: Yes, productivity versus experimentation—that is something that is very interesting here. First, because it’s a language/cultural thing, meaning something different in different places. Secondly, because it’s very hard to “do nothing” in China when the market is so prevalent and central to so many discussions. That is one reason why UCCA is so important in my eyes; this and the idea of creating these networks and opportunities to see things that are not necessarily market-driven. SOFIA: While I was in Beijing, I made a studio visit with Chu Yun, whose work I had seen once before and rather intrigued me. Many people told me there was no need to visit his studio because there was nothing to see. I went anyway, and during our meeting we had coffee and tea and just talked (Phil Tinari of Beijing’s Office of Discourse Engineering was my interpreter that afternoon.) Chu Yun said that he had been doing a lot, but nothing had worked. A year and a half had passed by. He had a shelf in the studio, and it was filled with hundreds of his failed experiments. I loved it. KATE: He is one of my favorite artists here, and also one of several artists that we are working with on the collection show at UCCA. SOFIA: Okay, but let’s go back a bit to your exhibition at the UCCA. I was present at the opening events of Stray Alchemists, and also during the following days filled with performances and public programs organized in conjunction to the exhibition. Aside from this, you were also giving a number of guided exhibition-walkthroughs. What does education or educating mean for you at the UCCA? KATE: The idea of doing open days was important for me because they are open-access, something that is unusual in China, as education is most of the time for pre-ordained groups. There are a lot of talks, of course, and these are important (and proven to be needed as we have really large audiences for them), but I also encouraged the education team to develop longer-term projects and to develop communities. When it comes to education, for me it’s important to think about the big picture. The education team at UCCA is young and very bright and willing to really push ideas. So, I introduced some models that I had developed while working in museums in the UK, like an experimental film/video class, a course led by artists that workshop with participants to develop film/videos, and a young critics course, where people can learn different ways to develop art criticism, as that is something that is not happening to a high degree in China (or other places come to that!). Anyway, these courses are a way of getting many voices contributing to the ways in which exhibitions can be looked at; they can be used as tools or launch pads into other people’s own creativity. SOFIA: Are these courses in discussion or have they taken place already? KATE: Both courses are already happening successfully and they will continue beyond Stray Alchemists to encompass other exhibitions. I don’t think an education program has to be one-show specific; it’s important to get people to think across exhibitions, too. I found that my experience in the UK, where gallery/museum education is more experimental and wrapped very closely into exhibitions helped with the development of the program here. It is to do with an attitude towards what education is. Also, for me, education is about life-long learning and about the importance of developing ways beyond academic frameworks through which to add a new dimension to exhibitions. SOFIA: And are you involved also in teaching in these courses, for example, the one of art criticism? KATE: Yes, although not all the time. SOFIA: So, do you think these long-term workshop-based programming that is being offered to audiences is conducive to the formation of critical audiences as a new community, and is it something UCCA can offer that isn’t otherwise available in Beijing? KATE: Yes, I think this is key to the success of building a cultural community around contemporary visual arts in Beijing. SOFIA: This definitely seems important now, and I say this because there is such a number and density of contemporary art galleries being built in Beijing for “international” audiences, so to say, rather than for younger people and emerging artists that are growing up there. KATE: Precisely. The international audience in Beijing is not the key audience or at least not the one I am thinking of. They will come regardless and have very different motivations. SOFIA: No doubt—your intensions of thinking locally, and working from there and from abroad, are clear. KATE: For me it is important to develop something that focuses on the people who live work here, and who want to play a role or participate in building a community and a network in and out of Beijing. SOFIA: Since we’re talking about education, I wanted to touch a bit on your own background, your formation and your experience. We can start in the early 1990s. After training as an artist, you were awarded the Arts Council Traineeship Program in curating in the UK. What do you most remember learning (or not) from this program, and how, if so, do you think it influenced you while creating the Curatorial Practice Graduate Program at the California College of Arts (CCA) in San Francisco? KATE: The traineeship was very particular insofar as it was learning on the job: I was the assistant curator of a museum as an arts council trainee. So, I learned everything through practice not theory, which was very influential in terms of the way that I thought about training in setting up the masters program—you have to make things pertain to the real world as well as understanding why theory is useful. (I asked the Arts Council if I could attend classes at the Royal College of Art during my traineeship, so I could participate in theoretical discussions too, and did so for a year, one day a week.) Any project you develop as a curator has to relate to artists, audiences and making sense of whatever context you are in, rather than being ideas that float around in relation to yourself and your own perspective on the world. I learned a great deal from Penny Johnson who was the director of the Towner Art Gallery where I trained. She worked me really hard, but always explained the context of what this task or that task was for, so I never felt I was just working for the sake of it—everything contributed to the bigger picture of making an institution what it was. This might sound obvious, but it’s rare to find someone in charge whom actually does that. She also gave me confidence in my ideas and my work. That is the greatest gift of all, as it meant I would work hard, listen, learn, and then I could take the tools that she gave me into everything I did after that. This is rare—there are too many people who forget that giving people confidence is so important to productivity. SOFIA: While you were Chair of the Curatorial Practice at the CCA, from 2002-2007, you were traveling regularly to Asia, visiting countries like Thailand, Taiwan, Singapore, Japan, and China, among many others. What were some artist initiatives and curatorial models that you found most interesting or influential? The Land Project, and a number of off-shoot projects that are developing in Chinag Mai in Thailand with Uthit Atimana, Mit and a few other pioneers who are inspiring younger generations too; Long March Project in China was very inspiring, and led to me working with Lu Jie in San Francisco; Arts Initiative Tokyo in Japan, who have an amazing and far reaching program and experimental ways to keep reinventing themselves both as individuals and as an organization. Qiu Zhijie in China, with his approach to education as integral to his art. (I’m working with him now to develop a project for this summer.) Weng Choi Lee and another project called p-10 in Singapore, who each have a number of initiatives and collaborations with different artists. SOFIA: Yes, there are many interesting initiatives active in Asia now—both by artists and curators. I’ve learned about several dynamic curatorial agencies here and there, but the model remains relatively uncommon—today most initiatives of this type frame themselves as “consultants,” and surely that regards the economy that partially (if not mostly) sustains them. It was a nice surprise to learn that you founded a curatorial agency in 1996, Smith + Fowle. The practicing model—working closely with artists in developing projects, and with institutions, but from outside of them—also reminds me of Art 2102 in Los Angeles, which you are also part of. Anyway, Can you talk about what it meant to found Smith & Fowle at that time—what was the context that it emerged in, the desires that propelled it and so on? KATE: I was trained as an artist first, and have always been interested in generative projects, whereby new ideas can develop and find space to evolve through exhibitions. For me, it’s not necessarily about curating in the traditional sense, but about starting projects through listening to artists ideas, looking at what they make, what they say and are thinking about, and how you can work with them to develop something that keeps that as the focus while also expanding from there. Otherwise, what is the curatorial role? It’s not about putting your ideas over everything, and not about just putting work in front of people. There is an aspect of productivity to the curatorial role as much as there is one to that of artists practices. It’s as complex, but it’s different to being an artist as it involves thinking about audiences and different ways of communicating too. These were some of the ideas that were instrumental for the formation of Smith + Fowle. The context was the 1990s in the UK—the lottery money coming on, which changed the way museums and galleries worked, the ability to think outside the box as a young person with opportunities beyond that of my parents, as well as the breaking down of boundaries between art forms and what art meant which was happening at the time. SOFIA: Finally, I wanted to touch on a project that you are currently working on independently from your work at UCCA. I know you were closely involved in the making of the book What We Want Is Free: Generosity and Exchange in Recent Art, edited by artist Ted Purves, and now Ted and you are working on a new book on Social Practice to be published this year. Can you talk about this upcoming publication—already the partnership between artist and curator, and how the method of writing it together advocates the subject matter? KATE: What We Want Is Free happened very shortly after I arrived in the States, and it was really Ted’s baby. I was the antagonist, if you like, as I had worked within the framework of socially engaged practice for a number of years but it seemed to me to be understood so differently in the States from Europe, which opened up a whole load of questions for me about culture, societies, education and histories and how it affects the way you approach a subject or a way of working. The long, hard thinking and constant discussions that evolved from this project affected the rest of my work, shifting and developing over my years in the States, and now also forms the heart of the way that I approach my research and interactions in China.The forthcoming book on Social Practices is also an extension of the last four years of discussion after the publication of What We Want Is Free. The new book puts artists’ projects and perspectives over theories. We are not trying to suggest that there is one way of looking at these practices. Indeed, we are actually making the sections oppositional in a way, so that you can see that similar practices can be seen differently according to frameworks. SOFIA: The book sounds great, and the ideas propelling your work at UCCA are very exciting. Thank you for the interview, Kate.